A couple of years ago I found an ad on Gunbroker.com for a 7 1/2” Ruger® Bisley Blackhawk®. From the very poor photo and description, the gun looked to be stainless steel. My plan was to shorten the barrel to 6”, which is 1/2“ longer than the minimum requirement to use for hunting in my state. To my great disappointment I discovered that the gun was blued, not stainless, but it did come with pearlite grips. Lesson learned, ask questions before buying. My long time shooting friend, Dave, offered to buy it from me since he already had a blued 7 1/2“ Bisley Blackhawk® and wanted a matched set for cowboy shooting, so I sold it to him for what I had in it. Fast forward a couple of years and Dave decided to get a pair of 5 1/2“ stainless New Model Vaqueros® to use for cowboy shooting. At the same time he decided to keep one 7 1/2“ Bisley for hunting, but he wanted to shorten the barrel of the other one (the one I sold him) to make it easier, to carry in a holster when in the woods, but still be legal in our state. So, Dave came over to my house and we went to work hacking on his revolver barrel. We decided to cut the barrel off right behind the front sight base. This would make the barrel just a touch longer than six inches. Dave used a regular hack saw to cut through the barrel. Needless to say, by using a hack saw the cut was not square. If you look at the last photo in this article, you can clearly see the rearward angle of the cut on the leftover piece. Fortunately I had a 90-degree muzzle facing cutter and a .45 pilot bushing which I purchased from Brownells. The pilot bushing keeps the cutter square to the bore. We used plenty of oil on the bushing and took turns turning the cutter by hand until the muzzle was square. 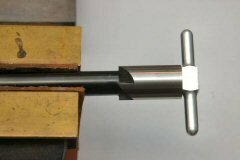 Next we took a 1/2“ 79-degree muzzle crowning cutter (also available from Brownells) to crown the muzzle. The outside of the muzzle would remain flat, but 1/2“ of the inside would be beveled and recessed. 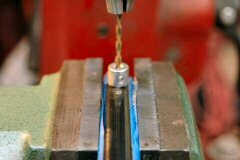 To remove the chatter marks left from the facing cutter we used 220 and 400-grit polishing sticks available from Boride Engineered Abrasives. We applied plenty of gun oil to the polishing sticks and applied them in different positions to ensure the muzzle stayed flat. Next, we took a brass muzzle lap (also from Brownells) with some 400-grit lapping compound to finish leaving the lands and grooves nice and sharp at the end of the muzzle. Squaring and polishing the muzzle left the outside edge very sharp. I took my high-speed rotary tool with a rubber abrasive wheel to this sharp outside edge to round it off. Finally, we took acetone to clean the muzzle and applied some Birchwood-Casey® Perma Blue® Gun Blue Paste to the exposed bare metal. After we finished it looked almost factory. Ok, you can’t have a revolver without sights, so now we needed to attach a new front sight. When I originally decided to cut the barrel I purchased a screw-on stainless steel front sight base that takes interchangeable sight blades made by Alpha Precision Inc. I also purchased the special centering punch to ensure I marked the barrel correctly. Dave and I cleaned the bottom of the sight base, and the top of the barrel with acetone and applied some Loctite 609. My wife’s hair drier helped to cure the Loctite in short time. This held the base in place just long enough so we could mark where to drill the three mounting screw holes. We double-checked, triple-checked, and quadruple-checked to ensure we got the sight base positioned correctly on the barrel. After marking the three holes, a brisk tap with a rawhide mallet popped the sight base off of the barrel. I cleaned the barrel and sight base with acetone to remove the Loctite. Following the instructions found on Alpha Precision Inc.’s web site, I took a #31 drill bit and installed a stop collar so I would drill no more than 0.100” deep. 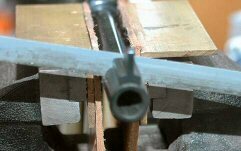 I lined the outside of the barrel with masking tape and chucked the barrel in the machinist’s vise on my mill table so it was level. I carefully aligned the drill bit to the center mark, then drilled up to the stop collar. I took a 6-48 bottoming tap and tapped the screw hole immediately after I drilled it. I used the chuck to keep the tap straight and centered. The hole was not very deep so I could only tap about three threads. After completing the center hole, I drilled and tapped the two end holes. After I tapped the holes I discovered that the screws were too long, or the holes were too shallow. I certainly didn’t want to drill the holes any deeper, so I used my high-speed rotary tool and a cut off wheel to shorten each screw by one thread. We cleaned all the holes and screws with acetone then applied a drop of Loctite blue to each hole and installed the sight base. The instructions recommended we use Loctite red, but that makes a permanent installation and someday he may want to change the sight base. Finally we installed the sight blade onto the base and applied a drop of Loctite blue on the retaining set screw. The stainless steel sight base makes an interesting contrast to the blue barrel and sight blade. The two-tone front sight matches the two-tone hammer. So now Dave has a revolver that is easier to carry in the woods, has replaceable front sight blades for different loads, and a properly crowned muzzle to maintain accuracy. Although this is a fairly short article, it took us probably 6 hours from the time Dave made the first cut until the revolver was finished. And even though we used my mill, this could also have been accomplished with a drill press. If I was to perform this job again, I would purchase a 0.120” square end bit and mill the screw holes in the barrel. I would then be able to tap more threads and not have to worry about trimming the screws. However, this project was successful because I had the proper tools on hand.